The nationally ranked No. 5 Louisville Cardinals started the 2019 NCAA women’s tournament the way everyone thought they would, even given a hiccup hanging over the program for a year. The top-seeded team in a stacked Albany region took care of No. 16 seed Robert Morris, 69-34, at the KFC Yum! Center in Louisville while suspended head coach Jeff Walz ate brunch at a nearby bar. The NCAA announced last May the 12th-year Louisville coach was suspended for one postseason game for his actions in the Cardinals’ Final Four loss to Mississippi State. “Specifically, Walz directed inappropriate comments and profane language toward committee members and NCAA staff seated at the scorer’s table,” the NCAA wrote in its statement. The biggest transgression came with minutes remaining. The Cardinals’ Sam Fuehring was called for a foul she didn’t agree with in a rebounding battle with center Teaira McCowan. She slapped the floor in frustration and referees gave her a technical. It sent Walz screaming down the sideline. 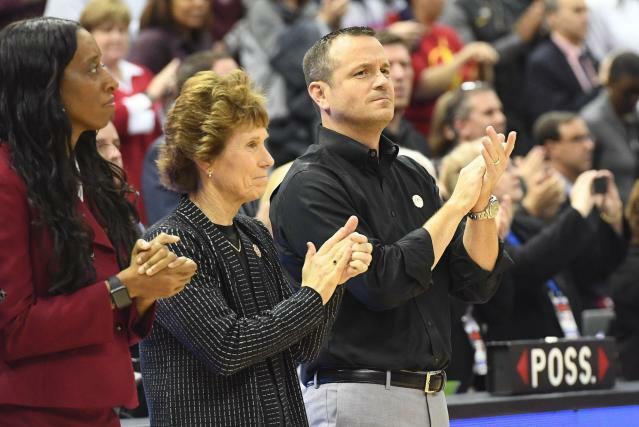 Walz prepared for the absence by having longtime associate head coach Stephanie Norman lead the Cardinals earlier this season during a non-conference game as a walkthrough, per the Louisville Courier Journal. Norman coached the team Friday while Walz ate brunch at the Sidebar restaurant across the street from the stadium. He seemed to take it in stride. Walz took in the game with Scott Davenport, a Louisville native and former Cardinals men’s basketball assistant under Rick Pitino. He currently coaches the men’s basketball team at Division II Ballarmine University. He even called in to the live radio broadcast to give some in-game analysis, and when all was done, he enjoyed the victory. Some fans brought fatheads so Walz could be there in some way. Others mentioned leaving the game early to watch with the coach from the bar and others found themselves with local royalty on a Friday afternoon. Louisville (30-3) got 19 points each from Asia Durr and Fuehring, who staked the Cardinals to a 32-4 lead early in the first. The defense held Robert Morris scoreless for almost 15 minutes. They’ll play either No. 8 Michigan or No. 9 Kansas in the second round, again back at Yum! Center and this time with Walz in the arena instead of next door. Walz is already back at work in the arena. UConn is on the other side of the regional bracket as the No. 2 seed for the first time in a dozen years, creating a potentially tough final in Albany before Louisville can get back to the Final Four.